Google's homepage may not seem strange nowadays, but its simplicity intrigued early Google users. "Try www.google.com. I've been most impressed with its ability to return good, relevant hits. Another big bonus with Google is that the site is almost completely clear of bandwidth-hogging graphics and advertising. The web site has to be the fastest I've ever seen," said a Google user in January 2000. "The prime reason the Google home page is so bare is due to the fact that the founders didn't know HTML and just wanted a quick interface. In fact, it was noted that the submit button was a long time coming and hitting the RETURN key was the only way to burst Google into life. Due to the sparseness of the homepage, in early user tests they noted people just sitting looking at the screen. After a minute of nothingness, the tester intervened and asked 'What's up?' to which they replied "We are waiting for the rest of it". To solve that particular problem the Google Copyright message was inserted to act as a crude end of page marker." While other search engines turned into portals, Google's homepage didn't change that much over time. 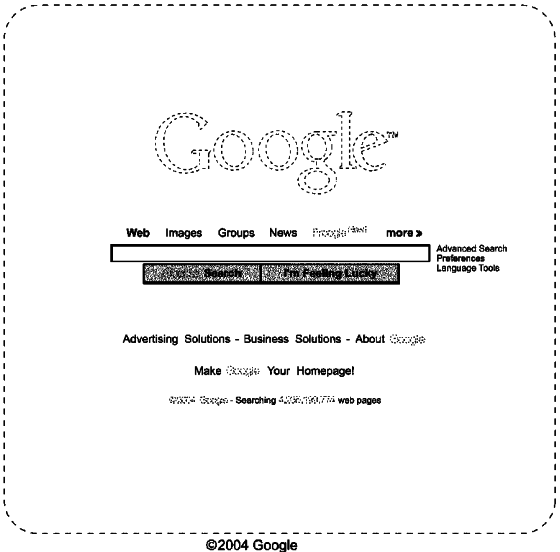 In 2004, Google filed a patent for google.com's design and 5 years later the patent has been granted. i suspect this is related to chrome OS. I don't know about the general public but I never use the Google home page to search anymore. I use the Chrome address bar and the Google search bars in other browsers all the time instead. Perhaps these developments reflect an acceleration of the principle of the original Google home page as being a simple way to get the right search results quickly. Finally! So what follows now? Is Google planning a prosecutions? !